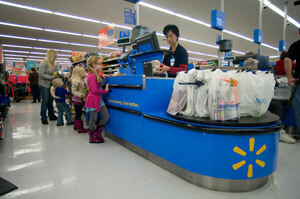 Walmart’s Wage Debate – Will it Affect Your Business? What if Steelcase were told it had to pay its minimum wage workers nearly 50 percent more than any other manufacturer in the state? Or Furniture Brands or any of the large wood products manufacturers with operations in the United States? What if it were your company that was targeted? How competitive would you be then? Whether a manufacturer or retailer, all wood products companies should take note of Walmart’s standoff with city officials in Washington, DC over how much the big box retailer should pay its employees. Passed last week, the “Large Retailer Accountability Act of 2013,” also known as a “living wage” bill, would boost the minimum wage from $8.25 per hour — already $1 higher than the federally mandated minimum — to at least $12.50. The bill applies to any business that operates a retail store of 75,000 square feet or larger within the district and whose parent company’s gross revenues total $1 billion or more on an annual basis. Interestingly, the “living wages and benefits” provisions “may be waived by the written terms of a bona fide collective bargaining agreement,” thereby excluding large unionized companies, or Walmart if it were unionized. The measure sits before Washington, DC Mayor Vincent Gray, awaiting his signature. Walmart, which prior to this had planned to build six stores – and employ 1,800 people – has already threatened to waive plans on three of the stores if the bill is passed. “What’s more, passage would also jeopardize the three stores already under construction as we would thoroughly review the financial and legal implications of the bill on those projects,” Alex Barron, regional general manager for Walmart wrote in a Washington Post op-ed piece. It was a difficult decision, Barron said. “Like any business, we have a responsibility to our customers, employees and shareholders to reevaluate our options when it looks as if local rules may significantly change. The LRAA would clearly inject unforeseen costs into the equation that would create an uneven playing field and challenge the fiscal health of our planned DC stores,” he wrote. As the nation’s largest private employer, Walmart has had its share of critics. But regardless of whether you are a fan of Wal-Mart or not, the issue at hand is this: Do you think city governments should have the right to single out companies for forced pay raises?